Another voice in the debate: is Liverpool changing for the better? You should be redirected automatically in a few moments, but if not, please click here to see if Another voice in the debate: is Liverpool changing for the better? has made the transition. We’ve seen how the debate is continuing over recent changes and development to Liverpool’s city centre. For a couple of years people worried that the centre was getting preferential treatment – and money – compared to the more needy suburbs. Now that change has swept across Chavasse Park and Hope Street, the moans are more concerned with how the old is being swept away to be replaced with the bland, average new. Today Ed Vulliamy comments in the Guardian how Hope Street, “one of Europe’s great boulevards, connecting the eccentrically massive gothic Anglican cathedral with the 1960s Catholic one” is being wrecked by new development. 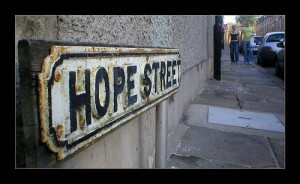 He also singles out the Maghull Group, and their ‘Hope Street Portfolio’. Personally, I find their slogan – “Invest. Develop. Construct.” – quite terrifying, along the lines of Veni. Vidi. Vici. And now we find that they bought part of the Liverpool College of Art complex from John Moores University, and are now renting it back to them, having not been able to do anything with the site in, as usual, these economic climes. Check out the article, and let me know what you think. The Maghull Group have some awful practice behind them, and don’t take lightly to criticism. Is Liverpool experiencing the ‘wrong type of change’? And what do you think of the Lime Street gateway? The buildings there were indeed an eyesore, but has Liverpool lost some hidden gems as the bookshops and greasy spoons of this world get moved on? Or are we freer now to admire some of the greatest Victorian architecture Europe has to offer? Are these little shops opening elsewhere? Comment is, after all, free.